Using flush-cutters cut six 3-inch lengths and two 2-inch lengths of gunmetal-plated 6mm filigree round chain. String one Swarovski 8mm bicone crystal aurum 2X, one gunmetal-plated 11x4mm bead cap (toward the 12mm round), one gold-plated 6x1mm bead cap (toward the 12mm round), one gold-plated 6x1mm bead cap (inverted with the curved end facing into the 12mm round bead hole), one 12mm round gold stardust bead, one gold-plated 6x1mm bead cap (inverted with the curved end facing into the 12mm round bead hole), one gunmetal-plated 11x4mm bead cap (toward the 12mm round) and one Swarovski 8mm bicone crystal aurum 2X onto a gold-plated eyepin. Using a pair of chain-nose pliers, round-nose pliers and flush-cutters, form a simple loop on the straight end of the eyepin to create a stardust and crystal beading link. Repeat to create a total of five stardust and crystal beading links. Using a pair of chain-nose pliers and bent-nose pliers, open an 8x6mm oval jumpring. Pass it through the loop on the corrugated ball portion of the box clasp and the corner loop one gold-plated and Swarovski 19mm sew-on component. Close the jumpring. Open a 5mm jumpring. Pass it through the opposite corner on the gold-plated and Swarovski 19mm sew-on component (one loop to the right of the corner) and the top corner (one loop to the right of the corner) on a second gold-plated and Swarovski 19mm sew-on component. Close the jumpring. Repeat to attach a second 5mm jumpring next to the first attaching it to the loop to the left of the center of both gold-plated and Swarovski 19mm sew-on components. Repeat to attach a third gold-plated and Swarovski 19mm sew-on component. Open a 5mm jumpring. Pass it through the opposite corner on the last gold-plated and Swarovski 19mm sew-on component (one loop to the right of the corner) and the first link on a 2-inch length of filigree round chain. Close the jumpring. Repeat to attach a second 5mm jumpring next to the first attaching it to the loop to the left of the center of the gold-plated and Swarovski 19mm sew-on component and a second 2-inch length of chain. Repeat to attach the last link on each of the 2-inch lengths of chain to a fourth gold-plated and Swarovski 19mm sew-on component. Open a 5mm jumpring. Pass it though the opposite corner loop on the last gold-plated and Swarovski 19mm sew-on component and the first link on a 3-inch length of filigree round chain. Close the jumpring. Open a 5mm jumpring. Pass it though the last link on the 3-inch length of filigree round chain and the first loop on a stardust and crystal beading link. Close the jumpring. Open a 5mm jumpring. Pass it though the opposite loop on the stardust and crystal beading link and the first link on a 3-inch length of filigree round chain. Close the jumpring. 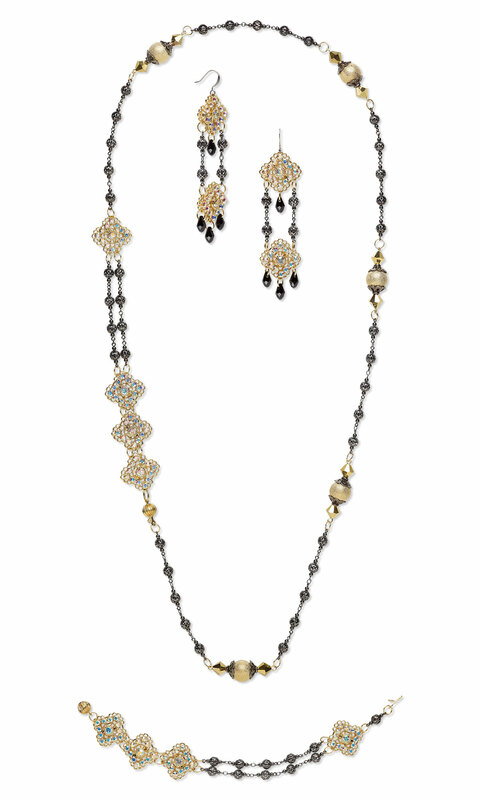 Repeat to attach five sets of 3-inch lengths of filigree round chain and stardust and crystal beading link ending with a 3-inch length of chain. Open a 5mm jumpring. Pass it through the last link on the final 3-inch length of chain and the loop on the insert portion of the box clasp. Close the jumpring. Using flush-cutters, cut one 1/2 inch length (one filigree beading link) and two 2-inch lengths of gunmetal-plated 6mm filigree round chain. Using a pair of chain-nose pliers and bent-nose pliers, open a 5mm jumpring. Pass it through the loop on the corrugated ball portion of the box clasp and the corner loop one gold-plated and Swarovski 19mm sew-on component. Close the jumpring. Open a 5mm jumpring. Pass it though the opposite corner loop on the last gold-plated and Swarovski 19mm sew-on component and the first loop on a 1/2 inch length of filigree round chain. Close the jumpring. Open a 5mm jumpring. Pass it though the last loop on the 1/2 inch length of filigree round chain and the loop on the insert portion of the box clasp. Close the jumpring. Using flush-cutters, cut four 1-inch lengths of gunmetal-plated 6mm filigree round chain. Using a pair of chain-nose pliers and flat-nose pliers, open the loop on a gunmetal-plated earwire. Pass it through the loop on the top corner of a gold-plated and Swarovski 19mm sew-on component. Close the loop. Open a 5mm jumpring. Pass it through the opposite corner on the gold-plated and Swarovski 19mm sew-on component (four loops to the right of the bottom corner) and the first link on a 2-inch length of filigree round chain. Close the jumpring. Repeat to attach a second 5mm jumpring on the opposite side fourth loop to the left of the center of the gold-plated and Swarovski 19mm sew-on component and a second 2-inch length of chain. Repeat to attach the last link on each of the 2-inch lengths of chain to a corresponding loop on the top edge of a second gold-plated and Swarovski 19mm sew-on component. Open a 5mm jumpring. Pass it though the bottom corner loop on the first gold-plated and Swarovski 19mm sew-on component and a Swarovski 7x4mm briolette drop. Close the jumpring. Repeat to attach a Swarovski 7x4mm briolette drop to the bottom loop, the fourth loop to the right of the corner and the fourth loop to the left of the corner of the second gold-plated and Swarovski 19mm sew-on component.